Help us learn about your demonstration as it happens, anonymously. Open the app, type in a description, and submit. 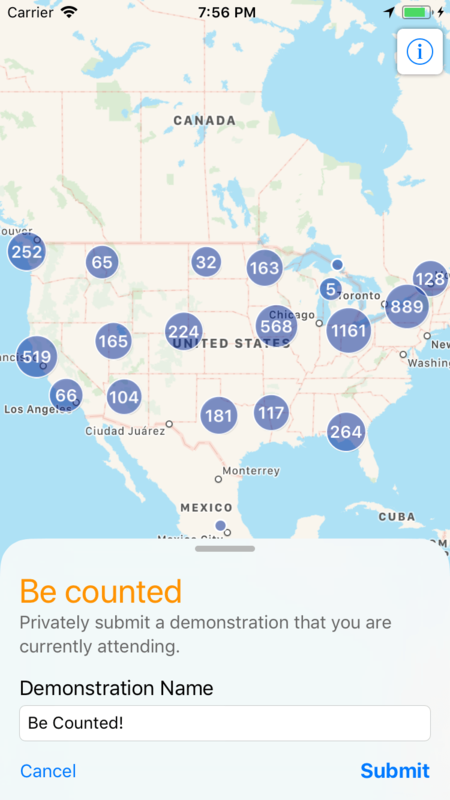 Using your location, we'll add an event to the map for verification, estimate a crowd size based on other nearby submissions, and find a local news report to link to. Help improve the accuracy of crowd counting. Crowd counting is notoriously difficult due to differences in local resources, privacy and safety concerns, and politics. Many of our primary news sources often report crowd estimates in the “dozens,” “hundreds,” and “thousands” of people. We hope that tools such as this app will help improve crowd counting estimates by adding one more primary source of information—you! Designed with anonymity in mind. We developed this app with the goal of counting individual participants, but not allowing any one participant to actually be identified. We collect only the minimum information that we need to verify a submission. We never transmit any personally identifiable information in its raw form, encrypt all communications between the app and our server, and only store the location and time of submissions. To learn more about the techniques that we use to ensure the anonymity and validity of each submission (such as pinning our SSL certificates to minimize man-in-the-middle attacks and using a “bloom” filter to evaluate submission uniqueness), please read our blog post about submission security and privacy.